Liat Segal (1979, Israel) | lives and works in Tel Aviv. A new media artist, fusing together art and technology. 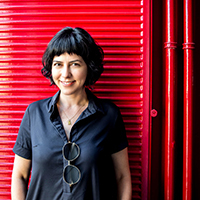 In her works Segal harnesses information, software, electronics and mechanics to build installations and machines that connect the physical world with virtual ones. Segal observes inconsistencies and dissonances that rise when personal lives meet technological evolving environments and questions issues such as intimacy vs. alienation, privacy vs. over-exposure, identity and originality as they reflect in technology. Liat graduated M.Sc. studies in Applied Arts & Sciences (Minerva Schools KGI, San Francisco, 2017), M.Sc. in Computer Science and Biology (Tel Aviv University, 2007) and the Interdisciplinary Program for fostering excellence (Tel Aviv University, 2005). She worked as a researcher at Microsoft Innovation Labs (2009) and taught at the Bezalel School of Arts and Design at the Hebrew University. Segal's recent works were exhibited at the Israel Museum, Jerusalem, Bundeskunsthalle, Bonn, Museum für Angewandte Kunst, Frankfurt, National American Jewish History Museum Philadelphia, Hansen House Jerusalem, Amsterdam Light Festival, Jerusalem International Light Festival and others. Personal dimensions and human behavior in technological environments interest me. I am intrigued by the ways we consume and analyze information and the effects information flow has on our self-identities, personal communication, choices, and intimacy. The daily exposure people nowadays have to vast amounts of data and the focus span we can give when we are exposed to private and reviling messages uploaded online publicly. I explore social and psychological changes that occur with the inflation of online private statements and data, data that is continually supplied and collected by and on us. Much of my way of thinking and my inspiration comes from my scientific and technological background. I studied computer science and biology and researched social, textual and biological networks. Many times I see the world as collections of data, mathematical representations or through biological models. Today this is reflected in my works. Technology is my material, whether traditional and commonly used or state-of-the-art. I create with technologies, out of their original contexts, and give them new and intimate purposes which have nothing to do with usefulness or usability – in the sense, we usually attach to these terms. The final artworks consist of several dimensions; a physical structure, motion, and mechanics, electronics, software and data. The act of building the machines and activating them is significant to me. I feel that the technical choices I make affect the final artwork just as much as the touch of a painter affects a painting. My installations and works have performative aspects. I create the conditions and choreograph the behavior but I also leave space for randomness. Whether in the starting point and data, in the interaction with the activator of the work or in its final outcome. After installing the setting and activating the work, I become a spectator myself.